Our Mail Production department offers every service necessary to get your mailing properly addressed and prepared to meet all the rigid requirements of the Postal Service. Experienced professionals watch all aspects in the production of your mailing assuring you the quality and accuracy you deserve. If your mailing calls for something our machines can't do — no problem. 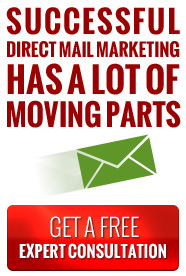 We have a dedicated staff to handle just about anything your mailing may require. We offer special handwork services such as envelope inserting for non-machinable pieces, as well as collation of materials and assembly of custom binders and promotional kits. We'll even make sure your products are packaged in a way that will keep the contents safe and meet shipping requirements, all in a cost-effective manner. We guarantee accuracy on hand-matching packages; if your mailing includes personalized envelopes, invitations, and response cards, you can rest easy that we'll make sure each package prepared is filled correctly with the proper materials. Don't tie up your company's valuable staff feverishly preparing mailouts, employee packets, or trade show materials. Let us provide you quick turn-a-round at a competitive price.